Exceptionally large and serene lacquer antique Buddha dressed in royal robes, intricately inlaid with inset flat glass/mirror mosaics backed with colored foil and further decorated with moulded relief work forming beautiful spirals. The Buddha is seated in "bhumisparshamudra" (subduing Mara), his left hand rests palm upward, on his lap, and the right hand rests on his right knee, calling the Earth to witness. He has elongated earlobes to demonstrate his princely parentage, and a very kind, pleasing face with gently smiling lips. Suitable only for large space/display area, good condition. There are no obvious losses and no repairs. The pinpoint hairlocks are worn here and there and the "Ushnisha" flame removable and probably from a later date, as is typical of such venerated images. Very strong impact and beautiful face! Size: H.190cm x W.135cm x D.85cm. 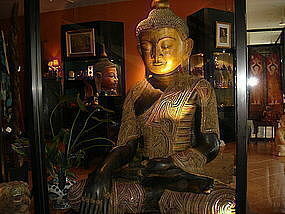 A Buddha of this size and condition is extremely rare to come by. Further photographs in this catalog under our item # 722032 and # 569851. ***Special note***: The image/figure is composed of hollow dry lacquer on a wooden base. It is hollow, and despite it's significant size, is quite light in weight. According to Isaacs & Blurton (2000), the dry lacquer technique of sculpture production appears to have originated in China. It is not clear when the technique first started to be used in Burma, but by the 18th Century the technique was well established. It had largely been lost by the mid-20th Century. The method involves a core image being modelled in clay. This is then covered by a wash of fine ash and water on top of which is applied a putty of lacquer sap and teak sawdust/ashes. This is further moulded and shaped, thus providing what will become the complete image/figure. Once the outer mold is dry, the inner clay core is removed and the outer image/figure can be sealed, coated with a refined lacquer mixture, polished, painted and often gilded. The end result is a fine but light weight sculpture.